I teach a monthly Christmas card club. Each month the club members make 4 cards, 2 each of 2 designs. I love it and they do, too! This card features several items from the Holiday catalog-- the Joyous Celebrations stamp set, the holiday frame embossing folder, and Silver Sparkle Dazzling Details. 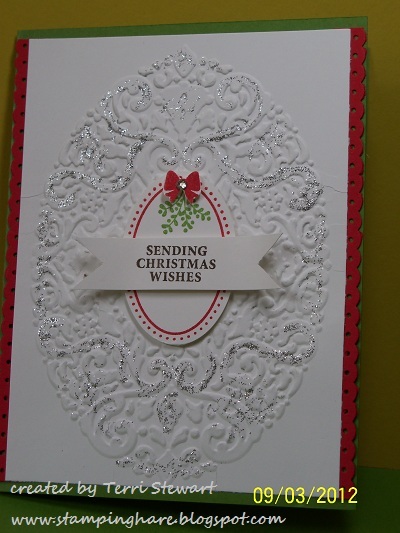 Have you started thinking about Christmas cards? I'd love to see your designs--please share links by leaving a comment! Drop me an email if you would like a Stampin Up holiday catalog mailed to you. PS--September is Back to Spool time! For every $40 ordered, pick a FREE roll of 3/8" stitched satin ribbon. Orders can be placed online, in person, or on a workshop order. Details here. Shop now--my online store is open 24/7! This offer is good through 30 September so place your order TODAY! WOW that is absolutely beautiful! Gorgeous! LOVE IT! You make the prettiest cards Teri! 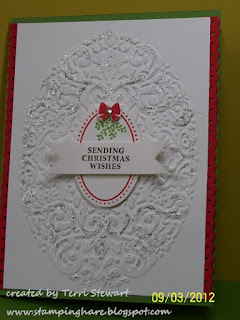 Hi Terri, love everything about this card, but that embossing folder is gorgeous. It's been almost 2 years since I posted... YIKES! It's been a little hectic on my end but I have been playing lately and hope tohave more posts. I'm writing mainly because I noticed that the graphics on my blog has disappeared and I'm looking into why that has happened. I'm also looking into migrating to WordPress. I've been making a lot of t-shirts lately and will post about them once everything is settled. For those of you that area actually still around - I appreciate it! I hope to bring a fresh new beginning to Kricut Krazy and become super active once again. I've missed you all dearly! Lets all do the Back to School HOP!!!!!! Hey Hoppers! I hope you are here for the Back to School Hop hosted by Pink Cricut! Lots of fun things for you to do and projects to look at and oh yeah, lots of prizes! Kricut Krazy is giving away a brand new Cindy Loo cartridge Courtesy of Scrappy Sales She has great prices and excellent customer service - most people have their orders within 2-3 days - no kidding! Show her some love by checking her out - she has some great sales. Memory Miser has donated Happy Hauntings for the Blog Hop - in order to win this, you must leave a comment on every single blog in the hop. Then Sarah (Pink Cricut) will draw the lucky winner for that after compiling all the comments from all the blogs. This was kinda fun. Super quick and easy. I've missed you all! What a crazy summer it has been. I just kept walking by my craft room and longing to sit down and do something fun. I've dabbled in things over the summer but no real crafty fun day. I've been cooking tons of stuff I find on pinterest (surprisingly most has been a huge hit!) I've tried my hand at washer jewelry - and failed (see photos below) but I'll keep trying. "If she dies, I have to sell her stuff for 3x the amount she claims she paid so I can get HALF the amount she did."